I just got back from a weekend away in beautiful Maine. I was hoping to post this before I left, click but never got around to it. Here it is in all of its delicious glory. Summer’s here and the stone fruits are starting to appear in huge quantities. I love nectarines and often bring them to work for my mid-morning snack. Although tasty, health they’re really not ideal for eating at your desk. Usually, I end up bent over the trash can as the juices run down my fingers and drip everywhere. Not very attractive. If you want to avoid creating such a scene at work, another way to eat those nectarines that I’m sure are piling up in your fruit bowl (aside from a delicious crumble) is to use them in a salad. They provide a nice substitute for the juicy tomatoes which have unfortunately disappeared from stores nationwide, lest we all become infected with salmonella. The jerk chicken is a nice compliment for the sweet nectarines and goat cheese and vinaigrette give it enough of a bite to curb the fruit’s sweetness. Just add some walnuts for crunch and you’ve got a perfectly well-rounded summer salad. Set a large skillet over medium-high heat and warm the oil, making sure the bottom of the pan is covered. Coat the chicken evenly with the jerk seasoning, then brown it for 5 minutes on each side. Add the stock and deglaze the pan. Cover, reduce heat to medium-low and let simmer for 10 – 15 minutes, until the chicken is cooked through and tender. You can let it cool at this point, or simply toss it onto the salad while still warm. Toss the greens with the dressing and distribute among 4 big bowls. 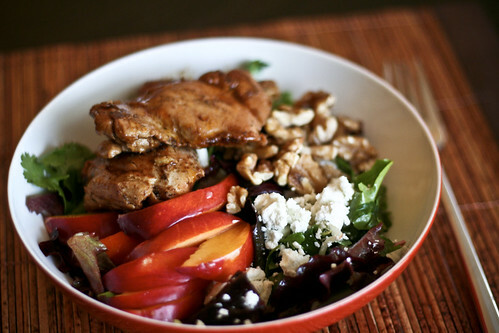 Top with a couple of chicken thighs, a few slices of nectarine, goat cheese and a handful of walnuts. *Brine the chicken by mixing 4 cups water and 4 tbsp. salt in a large bowl and soaking the chicken for 30 minutes to 1 hour. Whisk the ingredients together for a simple vinaigrette. Love this salad! Great combo of ingredients! This looks perfect; and I happen to have Penzey’s seasoning as well. Thanks: A great start to a tasty and healthy work week.